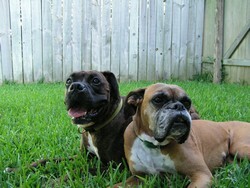 Lila is a petite 7-year old girl, who due to her age had been with Austin Boxer Rescue for over a year! If possible, she is actually more playful than her younger brother and is definitely a more avid ballplayer! She is also perfectly behaved and has instilled a wonderful sense of calm and contentment within our house. In just a few hours she was settled in here, and the cats were already out of hiding (we thought they would spend at least a few weeks punishing us for getting ANOTHER DOG! )… Attached is a picture… we did get them to pose together – which is hard work given that they are both Boxers – and Boxers rarely stay still! Kate, Aaron, Miles, Lila & the rest of the menagerie!